Neutrinos are everywhere, and yet their presence is rarely felt. Scientists have assumed for decades that, because they interact so little with matter, neutrinos must lack any measurable mass. But recent experiments have shown that these "ghostly" particles do in fact hold some weight. Ever since, the hunt has been on to pin down a neutrino's mass—a vanishingly small measurement that could have huge implications for our understanding of how the universe has evolved. Today, a major experiment has joined this fundamental search. 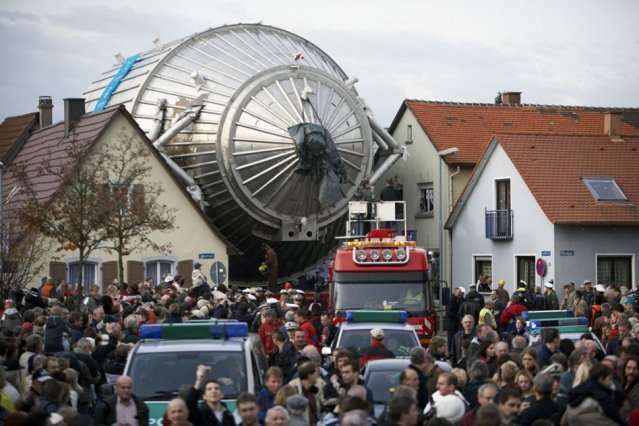 The Karlsruhe Tritium Neutrino Experiment, or KATRIN, is a massive detector based in the town of Karlsruhe, Germany, that has been designed to measure a neutrino's mass with far greater precision than existing experiments. At KATRIN's heart is a 200-ton, zeppelin-like spectrometer, and scientists hope that with the experiment launching today they can start to collect data that in the next few years will give them a better idea of just how massive neutrinos can be. Professor of physics Joseph Formaggio is part of the team of scientists that will get a first look at KATRIN's data as they come in. Formaggio and others from MIT helped construct part of the detector's apparatus and developed software to simulate the trajectory of particles passing through the detector. His group is now working along with a team of scientists around the world on software to analyze the data for signs of neutrino mass. MIT News sat down with Formaggio ahead of the experiment's launch, for a chat about KATRIN and the monumental structure built to search for an infinitesimal signal. Q: How will KATRIN measure the mass of a neutrino? A: KATRIN is addressing a very old question, one that was posed by [Enrico] Fermi in the 1930s, which is the question of how much mass a neutrino has. Decades ago, we thought the neutrino had to be massless. Then experiments in neutrino oscillations showed that no, that wasn't actually true—neutrinos actually have a tiny mass. And now we know that different neutrinos have different masses from each other. What we don't know is how much any one neutrino weighs—the absolute mass is still unknown. KATRIN addresses this question by looking at energy conservation: E = mc2. We have a radioactive gas, in this case, tritium, that releases energy as it decays. Some of that energy goes to a neutrino, which flies off and we never see it again. Some of that energy goes to an electron, and if you measure the electron's energy very precisely, it turns out that tells you how much the neutrino took away. And in particular, was that energy all kinetic, because the neutrino was going away at the speed of light? Or does it have a little bit of rest energy, or mass? The experiment itself is about 70 meters long—almost a football field but not quite. Tritium is injected at one end, into a windowless tube, where there are millions of decays happening per second, all of which will produce electrons. The gas sits inside a magnet, and the electrons, because they're charged, see this magnetic field, and they begin to follow the magnetic field lines out of the gas region and into a huge spectrometer—one of the largest vacuums in the world. The magnetic field is very weak in the spectrometer, and the field lines will start to spread out. The spectrometer is held at an electric potential of nearly 20,000 volts, which acts like a hill: Electrons that have enough energy will make it over this hill and come out the other side of the spectrometer. The ones that don't have enough energy get turned back. Then there's another set of magnets at the very end of this long beam line, where the field lines get tighter, the electrons focus back in, and they land on a detector that just counts electrons. This is a very precise way of scanning electron energies from this very hot, radioactive source. And that's what allows us to get the energy resolution we need, to say something about neutrino mass. Q: What is the current estimate for a neutrino's mass, and how will you know you've reached an even more precise measurement? A: We have some idea of what the neutrino mass scale should be. Previous experiments have told us that it's somewhere between 10 millielectronvolts and 2 electronvolts. An electron, which is the other lightest particle that we know about, has a mass of about 511,000 electronvolts. So somewhere between 10 meV and 2eV is our playground. If the neutrino does have a mass, what does it look like in our experiment? What we do is we image the spectrum of electron energies. If the neutrino has a mass, it looks like a kink in our spectrum. So we look for that kink, which would mean that the neutrino has both kinetic energy, which we expect, but also rest energy. If it were all kinetic, then it has no mass, and it's zipping along at the speed of light. If you observe a kink, it's as if you made a neutrino that stood still. Things can't stay still if they are massless. The kink is evidence that you produce just a few neutrinos that were standing still. You didn't see them directly, but you saw the electron didn't take the energy that it was supposed to, and that energy went into the neutrino. Q: In what ways would a more precise neutrino mass change our understanding of the universe? A: For other particles like the top quark and the electron, we might not understand why they have the masses they do, but we understand how they have mass. For the neutrino, that's an open question. How the neutrino gets its mass is unknown. The hope is, by measuring the mass of the neutrino, you get a better sense of how a neutrino gets its mass. We have billions of neutrinos everywhere in the universe. If all of a sudden they have a mass, they will impact how the universe will evolve over time. For cosmologists, that information will be very useful. So there's a little bit of, what's going to happen when we actually make a measurement? Will we see something massive? There is a possibility for surprise, and that could be most exciting, because it would mean we really don't understand what we're doing, and that's usually good for us. This is a long experiment coming. I joined the experiment when I was a postdoc in 2003, and there were people thinking about it even before then. It's taken a long time, and it's an incredible marvel of engineering. Because each time, they've had to solve a problem that didn't have a solution yet. How do you build a tank of that size, and evacuate it so that it's in vacuum? The tank is empty. Of air! And it's a huge tank, one of the largest vacuums in the world. That's an engineering feat. How do you keep the radioactive gas cold and stable to a few millikelvin? All these things really took a lot of engineering, and it's a beautiful experiment. Now we get to take data, and that's going to be very exciting.